1. “The Marriage-hater” or “The intreagues of the town”, 2. “The Siege of Limerick”, 3. “Sancho Pancho”, 4. “I often for my Jennie strove”, 5. “The Cornish Squire”, 6. “The Geud Man of Ballangigh: To a New Scotch Jigg”, 7. “Argeers,” or “The Wedding Night”, 8. “Lady of pleasure”, 9. “Pell-mell”, 10. “The King’s Jig” or “Winchester Wedding”, 11. “Blue Petticoats or Green Garters,” 12. “New Year’s Eve”, 13. “The Lord Monk’s March”, 14. “Daphne”. Guitar chords are supplied as an alternative to keyboard accompaniment. 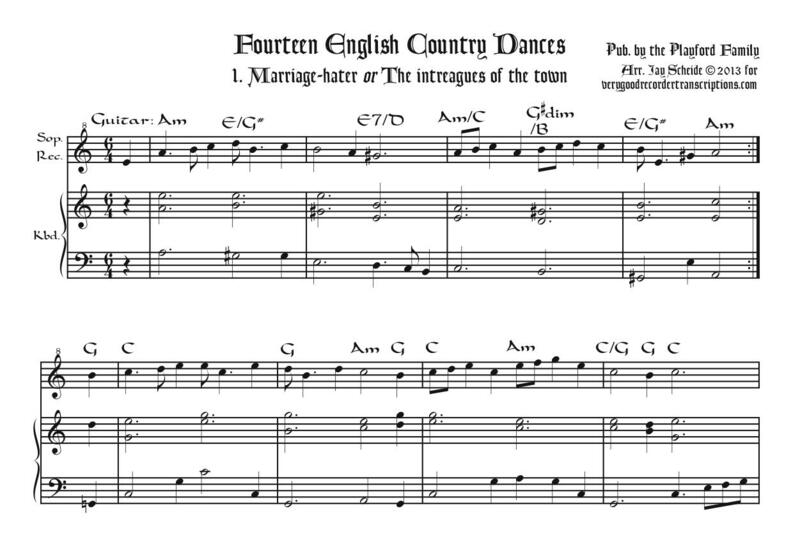 Note that all of these are included in recorder-duet versions among our “30 English Country Dances” duet set. Important revision April 1, 2019.